AAU club championships Kayla threw a personal best in javelin finishing 14. Kayla finished 6th in shot put and 2nd in discus. 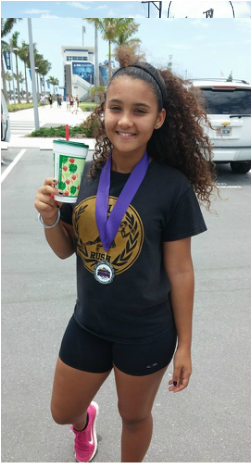 June 26-29, 2014 Kayla finished 4th in long jump, 2nd in shot put, 1st in discus and 2nd in Javelin with a personal best of 45-1 in the AAU Regions at Ansin. Kayla finished 6th in long jump with a jump of 12-02, she also finished 4th in shot put with a throw of 31-1,5 and 1st in discus with a throw of 87-9. May 31, 3014 Kayla finished 1st in shot put with a throw of 30'7" throwing further than any of the age groups. Kayla also finished 1st in discus with a throw of 82'4.5" and finished 2nd in long jump. May 23-25, 2014 The Golden South. Kayla competed in the Golden South meet in Orlando this weekend. She finished 7th in shot put and 3rd in discus. Awesome job Kayla. She was the youngest competitor in both events. May 10, 2014 Middle School States, Kayla threw a personal best in both shot put and discus. Kayla started off in 28 place in shot put and finished 10 with a throw of 34'9 and is the new Middle School State Runner up in discus with a throw of 92'9". April 12, 2014 Kayla competed in the MS Regional meet at Belin in Miami. Kayla placed 3rd in both shot put and discus and met the qualifying standards for the the MS State meet in Bradenton. She threw a personal best in shot put of 31'2 1/2 "
April 5, 2014 Kayla threw 78'4" in discus and finished 2nd and threw 30'9" in shot put finishing 2nd and jumped 11'4" in long jump. 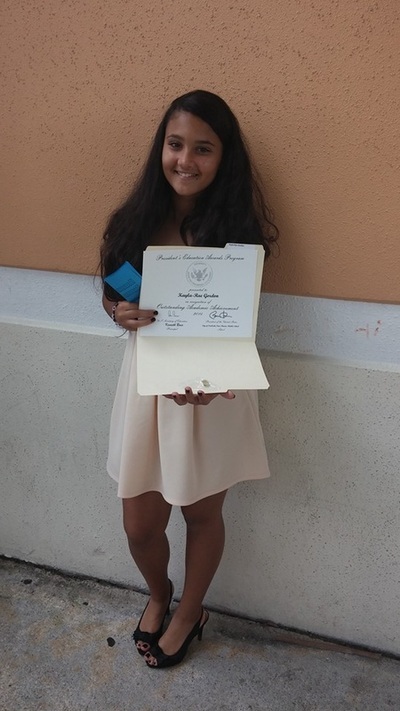 March 29, 2014 Pompano Express Meet. Kayla did long jump and finshed 1st in both shot put and discus. 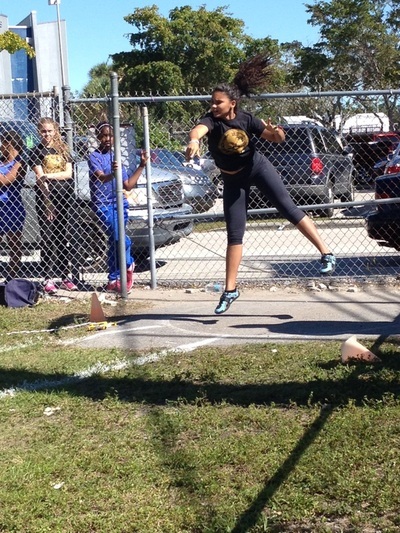 She threw a personal best in shot put of 31'0"
March 8, 2014 PAL of North Miami Kayla finished 1st in shot put with a throw of 27', she finished with a personal best of 13-4 1/2 in long jump and 4th place. March 1, 2014 Curtis Park meet @ Betty Ferguson Kayla finished 2nd with a throw of 29' and jumped 11'4" and finished 4th. February 8, 2014 Hallandale All Comers Meet. Kayla is starting off the season as one of the top contenders in her age class. She threw 27 10.5 in shot put and the upper 60's in discus. She had an awesome throw that was just out of the sector and would have been in the 80s. Keep an eye on her she is going to be a force to be reckoned with now and in a couple of years. Kayla started her first meet off this season with a firm statement. She finished 1st in the discus with a 44'5" and a 2nd in the shot put with a 21'5'. Great job Kayla. South Dade Express meet @ Booker T Washington 3-23-12 Kayla finished 8th in shot put. Discus was cancelled. May 25, 2013 Kayla is doing awesome she is progressing great this season. She had another personal best in discus with a 60'5.5" finishing 1st and 1st in long jump with a jump of 11'5" and second in shot put with a throw of 22'0". Keep up the hard work it is paying off. AAU Districts June 1 & 2, 2013 Kayla long jumped a 11-5.5 and finished 4, she finished 2nd in discus and finished 4th in shot put with a 22.25. June 15, 2013 USATF Districts Kayla finished 12 in Long Jump, 5th in shot put, she got a new personal best in discus and finished 1st with a 63'8". Kayla finished 2nd in discus with a new personal best of 68'5". The finished 4th in shot put with a personal best of 22'11 3/4" and jumped a 13'3" in long jump finishing 7th. 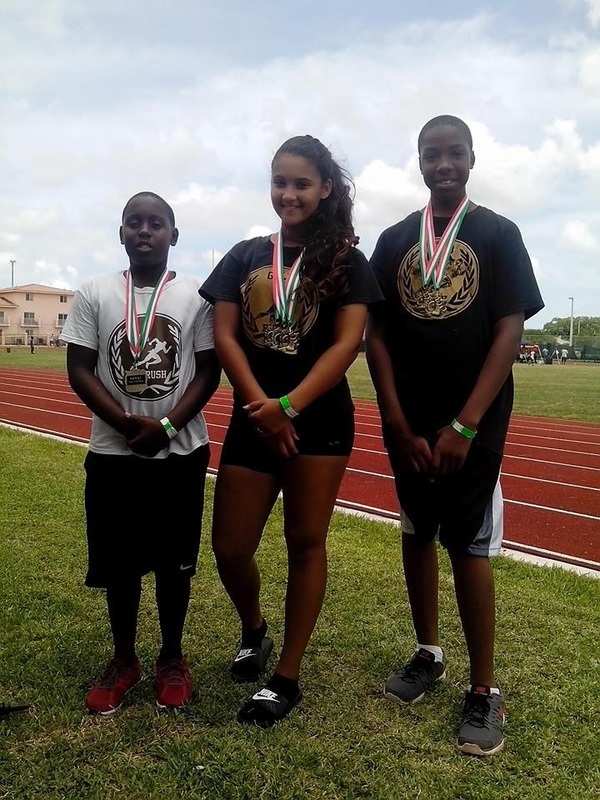 July 4-7,2013 USATF Regional Junior Olympics Kayla won a gold medal and had a personal best in discus with a 70'9". She threw 24'4 1/2" in shot put and finished 10 with a personal best. July 27-August 3, 2013 Kayla participated in her first Junior Olympics this season. At the AAU Junior Olympics Kayla finished 13 in discus, and will be participating in shot put tomorrow morning.